Due to some disorganization in my college dorm, the Knit Picks order I ordered on February 10th, which was shipped on February 14th, did not arrive in my hands until today, February 29th. What fun. This would be no huge problem except I was planning to use some of the yarn inside to make a gift. I have already made my lovely British boyfriend a scarf, so why not a pair of socks? Sure his feet are kind of ...manly, but I'm up for the challenge. 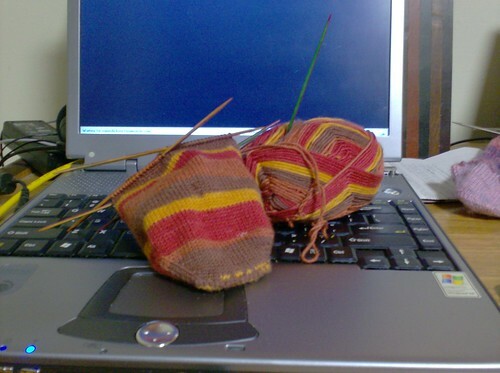 I can do big socks just as easily as I can do small socks. The original plan was getting these socks to him by Easter, which would mean posting them by... About this Wednesday. Hmm. But I'm a beast, right? I can get through these things like nothing. So, I have decided. DECIDED. I will knit these socks and nothing else, not even as much as a dishcloth. Just miles of stockinette socks. Not bad, hmm? That's 12 1/2 out of the 27 1/2 cm I have to knit (that's almost 11 inches, folks), not counting the cuff. I'm making good time.